Katie Mayo often pays $100 late fees to her landlord because she has to wait until payday to make rent. And many months she has to decide which bills get paid on time. "All my money goes to rent and utilities. I am living pay day to pay day," she said. 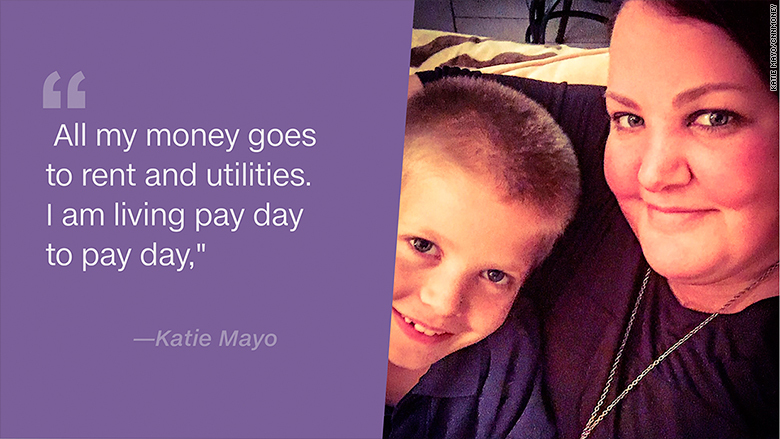 Mayo, 36, who lives in a one-bedroom apartment with her 10-year-old son in Pensacola, Florida, gets two paychecks a month. After paying rent, power and phone bills earlier this month, she'll be left with roughly $42 to stretch to her next paycheck. "I'll have no choice but to overdraw my checking account to make sure I have enough food and gas in my car to make it to next week." She said rent would be a little cheaper moving to the other side of town, but that means forcing her son to change schools, doubling her commute time and moving to an area that she doesn't consider as safe. Mayo would like to buy a home someday, but doesn't see that happening any time soon. "I don't have the ability to save," she said. "I have no emergency savings." Millions of Americans are getting squeezed as rents rise much faster than wages. A recent report from Harvard's Joint Center for Housing Studies showed that 11 million people are spending more than half their income on rent. And it's forcing them to make some tough decisions like skipping meals, uprooting their families or abandoning dreams of becoming a homeowner. 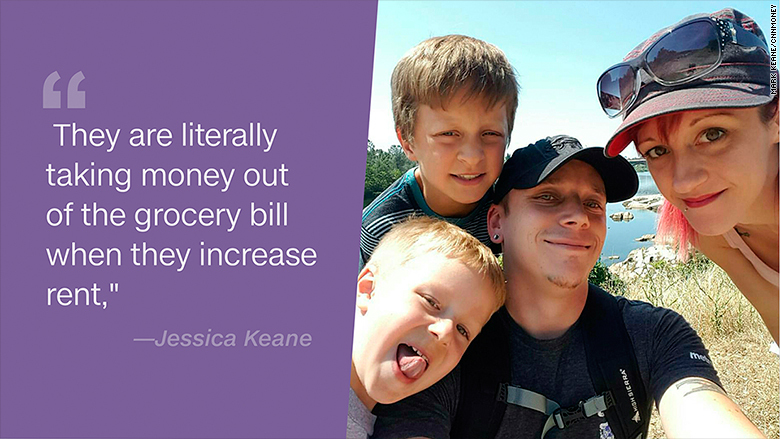 "They are literally taking money out of the grocery bill when they increase rent," said Jessica Keane, a renter in a suburb of Sacramento, California. Keane lives with her husband and their two sons in a two-bedroom apartment. The couple has moved five times in the nine years they've been together, to escape rising rents. They're a single income family because childcare would cost as much as Keane would make. Every month, rent consumes around 44% of her husband's take home pay. The family tried to become homeowners at one point. They lived with Keane's mom for nearly three years to repair their credit, pay down debts and save for a down payment. They saved $5,000 and were approved for a $250,000 FHA loan last year. But after seven months of house hunting and getting outbid, they gave up and decided to go back to renting. In less than a year, the $5,000 they'd saved for a down payment is gone thanks to moving and renting costs. Keane's dream of owning a home has also faded. "Rent is so high we can't afford to save up money for a down payment," the 30-year-old said. "There is no money left over after rent and food and bills. It's left me with a sense of hopelessness." Their credit has taken a hit again since there are times they can't afford all their monthly bills. "There have been points over the year where I won't eat so my kids can have food." 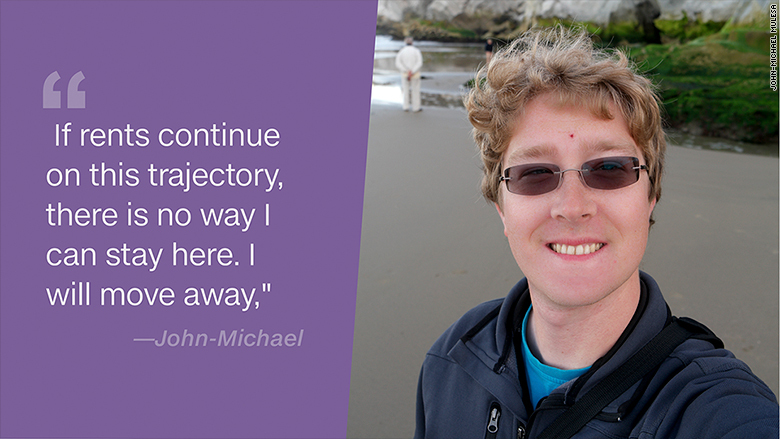 When John-Michael Mulesa accepted a job at one of the biggest tech firms in Silicon Valley and moved from Indiana in 2014, his salary jumped around 45%. His rent payments also increased by more than 200%. The area's tech boom has increased rental demand and pushed prices up. San Francisco is now home to the most expensive rental market in the U.S. He describes his 800-square-foot apartment that he initially paid $2,010 a month for as one of the cheapest rentals in the area. "I got lucky, but it was still obscene at the time." Last year, his rent increased by nearly 10%. After taxes and 401(k) contributions, the 27-year-old now pays more than half of his income in rent. He looked for other apartments in the area, but he wasn't able to find a better alternative. Luckily, he also got a promotion and pay raise last year, which helped make the rent hike more tolerable. But counting on a promotion every year isn't sustainable. 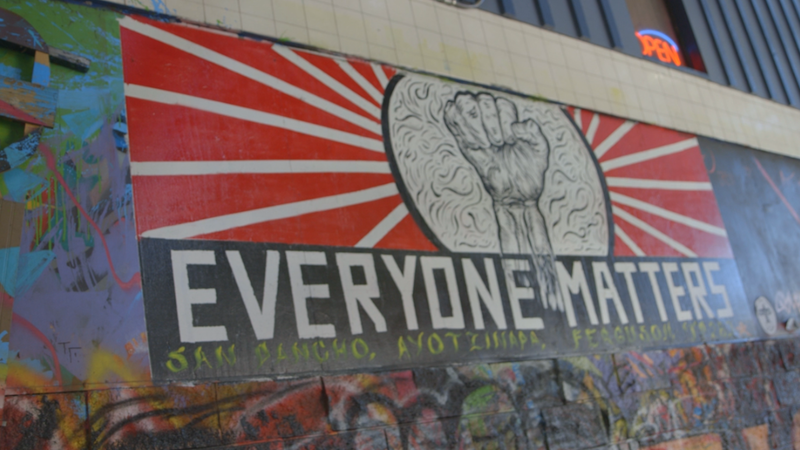 "If rents continue on this trajectory, there is no way I can stay here. I will move away," he said. Did you recently purchase your first home? We want to hear from you: Tell us your story and you could be featured in an upcoming article on CNNMoney.